I was working on a model to take to Colchester last week. I didn't have a lot of time so I went for a 1/72nd fighter. We had had a Hasegawa F6 Lightning returned to the shop for replacement because it had a hole in the fuselage side. I felt that this could be filled and to save the kit being binned, I decided to have a go. 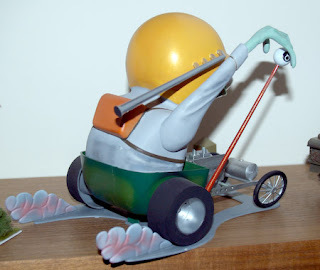 I didn't realise that it was actually a rework of the old '70s Frog kit but soon found out when I saw the detail in the cockpit and the wheel wells - none at all!!!! But - hey - it wouldn't take long to make. I called my wife over to tell and show her what a mess I had made when I noticed that the tail planes didn't fit tightly and I had missed filling the gaps. before she knew what had happened, I had brought down my fist and smashed it! Now this is very unusual for me. I am not noted for violence, nor for destroying kits - I tend to keep them even if I can see the poor job on them. I think that I had done so much soul searching about my abilities recently that I had just had enough. Now I have that out of my system, I can show you what I did take to Colchester. I managed to put together a Hobby Boss UH-34A Choctaw in French Marine colours. Only one problem - the large F of the fuselage broke up so I left that and the other two off. Maybe Dom won't notice - Dom is the helicopter specialist at the Ipswich club. This Hobby Boss kit is quite nice. A decent interior, good panel detail, decals for the rotor tips and dropped rotors. I still have to do two elements for the Land Sea and Air competition at Colchester next month. I am planning an Airfix RAF Air ea Rescue launch for the sea element. I already have my Hawk Weirdo for the Land. 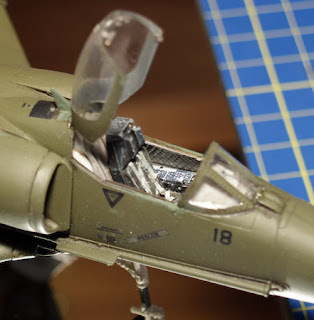 The Air element is going to be the hasegawa 1/72nd PBJ USMC Mitchell. This is going together quite nicely and it seems that the fit on the wing joins is so good that I can probably paint it and put the wings on afterwards. That will help with the USMC Pacific three colour camo on the fuselage. There is a radome on the end of the starboard wing which means cutting the tip off. That's done - as you can see - and it went well. 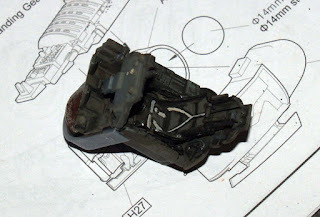 I have managed to break the rear machine guns off but it was always hope over experience when I fitted them. I can get some brass tube to replace them so that should be OK.
Great news from Colchester - I came 3rd in the annual competition. This was aided by the fact that I had entered on 9 occasions and scored on 5 of them. It was also helped by winning with my Ice/Beer diorama. Mind you 2nd place also entered 9 times and scored 5 so my record was good. It's the Ipswich club on Tuesday and I am going to take the Choctaw and the Sky Hawk. I am hoping to collar Brian - who did the excellent RNZAF Sky Hawk a few months ago - to give me five minutes and tell me where I have gone wrong. Hopefully I can learn something from him. Modelling at last - again! Not having written anything since September, I need to do a bit of catch up. Skyraider - didn't go anywhere. I messed up the camo, had another go and am still not happy so it's on hold. 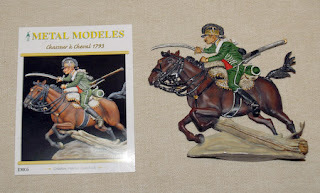 Metal Modeles Chasseur - I finished this one. 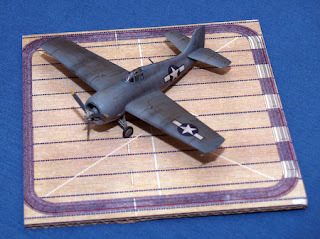 Academy F-4f Wildcat - This was a model I made three years ago - left it very bland as it was a demo for the shop on how to make a model. Having taken part in a weathering discussion at Colchester I decided to have a go at weathering it. I used MIG pigments on the panel lines and sprayed some lighter blue to give it a faded look. Forgot to mask the canopy so had to put a new canopy on to it. I had a 1/48th carrier deck from Verlinden which I scanned, reduced and printed out for it to stand on. Hawk Weird0 - Digger. This is a hark back to the Sixties. All the problems of a Sixties model with poor fit, etc. However, it was great fun to build and paint. The tragedy came as I was taking it to the club - Ipswich. I had my camera bag over my arm and it dropped, knocking the kit to the floor. It broke into a few pieces. I ran back to the modelling table and - with copious amounts of superglue - got it back together again. However, when I got out to the car, my thumb was superglued to the dragster tub. Hence, you will find my thumbprint stuck to the model. It was my skin or the kit - the kit won! 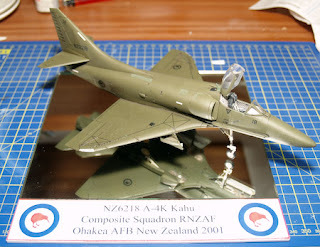 Finally - RNZAF Skyhawk - Gekko brought out some New Zealand decals for a Skyhawk so I thought I would have a go. I did intend to do the low-vis three colour scheme but found out that it is on the underside as well as the upper surfaces and not having had much joy with the Skyraider I decided to do the low-viz - all green scheme. This is an interesting scheme as they used to touch up the panels as it got a bit worn - colours didn't match so I have tried to do that with the model. I did get an Aires cockpit but ruined one body shell trying to fit it. I did use the Eduard painted etched for the cockpit and canopy. Well, the shop has been frantic for the last few weeks. We have been refitting and extending the shop area, completely rewriting the web site and ordering lots of nstock from a wide rangeof new suppliers. This has meant late nights and weekends so littletime left for modelling. We are near to completing the expansion plans so I am now getting back to something at long last. A recap first. I finished the Alemany Stug - including the four figures that came with it. I put it on a small base. However, when it came to Colchester club time, I couldn't find the figures. 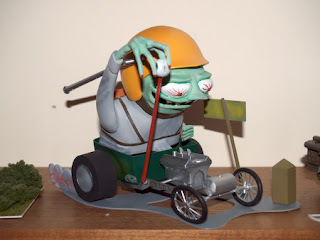 Hence the model is waiting until I can find some replacement figures for it. Don't forget to click on each photo to see a bigger version. I finished the 4th Ciurassier flat and took it to the Ipswich club. However, I appear to have left it at the shop so can't give any finished photos of it yet. Recently, we have been finding an interest in the shop for more expensive Iwata airbrushes - specifically, the Hiline HP-C. As I had little experience in using or cleaning this, I persuaded my wife that, as we needed a demo airbrush in the shop, I should let my Eclipse go and get a Hi-line. So I am now experimenting with the new acquisition. I have to say that it is a bit smoother and slightly more accurate (see below). Having asked my wife and regular in the shop Aaron for a suggestion for my next project they were about as helpul as a paper umbrella. Hence I was left to choose. The idea was that they gave me something unusual but... So, I have a 1/48th Tamiya Vietnam Skyraider on the stocks. 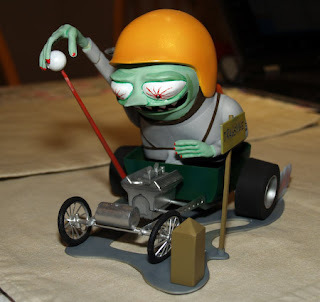 Doing this reminds me why Tamiya are so respected. Everything fits - no filler, no messing around. I have now painted the cockpit - fully airbrushed with the Hi-line with only the knobs picked out with Vallejo using a brush. I have also airbrushed the wheel wells, including all the shading. I just love my airbrush! Hopefully, I am back to a weekly development in my modelling and a weekly post to the blog.